It has been hotly rumored that Apple will launch a new, 4-inch iPhone during its forthcoming spring event, with reports suggesting that said device will carry the 'iPhone 5se' moniker. Said to be cut from a similar cloth as the iPhone 5s, case makers are betting that it will follow a similar design language to the flagship iPhone 6s and 6s Plus -- adding a degree of uniformity to Apple's smartphone roster. Another interesting theory has now been thrown into the ring, suggesting that a 'hot pink' color configuration could also be in the offing. Of course, it's not the first time we've surveyed the prospect of a pink iPhone. It's a rumor that lingered through much of the iPhone 6s build-up. That time around, the chatter referred to the now-rose gold color option, which was probably mistaken by leaksters as straight-up pink. With the iPhone 5se, however, a brighter, more saturated hue could be in store. It's not uncommon for rumors to regenerate with each potential new iPhone. As such, the report from Japanese blog Mac Otakara may be taken with a pinch of salt. Then again, this publication has a fairly decent track record for making calls on unreleased Apple products, and while a bright pink iPhone wouldn't be to everyone's taste, we all know of people that would likely jump at the chance to own it. The report doesn't really mention the gold color option available for the iPhone 5s, so there's reason to suggest that hot pink could replace gold -- a potentially polarizing decision in the making, one suspects. With no concrete leaks and mostly speculation to abide, it's too early to make any definitive judgement. But based on this report, the iPhone 5se could be available in Pink, Silver and Space Gray. According to the oft-reliable sources of 9to5Mac, the Apple's event will be held on March 15. Along with the iPhone 5se, Cupertino is expected to showcase the iPad Air 3, as well as some unspecified announcements pertaining to the Apple Watch. A 'hot pink' iPhone, though. It has to be asked -- would you buy it? Let us know what you make of this via the comments. I'll get one , just to piss off people like you. go ahead... apple is planning to give pick underwear (flowers printed) as a combo offer... Lmao..
No need for Samsung and the other Android phones to give underwear as combo offer since Android users have no balls to put it inside. And yet for some reason most Android users are male? I thought having testicles was a requirement for that. They probably wont be pissed off, surely they'll just laugh at you. Like that matters to you anyway lol. The perfect color for Ipig! Judging someone's ability to talk to women based on stupid fanboyism, that's pretty darn smart. You should start your case study on that. Space Gray, Gold and Hot Pink. I'm OK with that. It's all about that 7+. Now that's a pink phone a man can be proud to own. 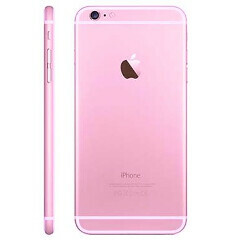 The current "rose gold" is frighten ugly. Space gray is THE color. A real man would have no problem owning a pink phone. Because I'm not a brain dead fan boy like you. So a logo determines whether the devise is good or bad? Brain dead? Huh? Yeah, because Apple doesn't make good devices, just expensive ones that bleed their customers dry. Funny how I didn't see you trying to defend Apple in that article about the repair shops though. Keep sheeping on Alik! iPhone cost as much as android phones but are faster, have better ecosystem, offer face to face support among many other things. How do you deal with bloatware, lack of updates, manufacturers who can't build their own operating system and just sell you a device with freeware designed by a company that's core business is advertising. Dude, because you're new, I'm gonna let on a little secret - all devices have pro's and cons and everyone has different needs and pick devices they like most that work for them better than other devices. Regarding me defending Apple regarding error 35. Well I was just putting the other point of few than the same the jargon that goes on this forum. Read my other post on the matter and you'll see my view of the situation. Enjoy your android. Seriously, I've been here for a while and you're probably the single member that is the most full of it, you're also really easy to rile up because apparently you can't get it up without white knighting for Apple. Have fun with that.